Pridebites Ice Cream Cone- This has a squeaker and floats! I don't know that we will be taking Bugsy to the lake in enough time to test this out. He's already run off with this toy and is happily squeaking all over the house. Luckily, it's machine washable because I took him outside with it and it got kinda grubby. 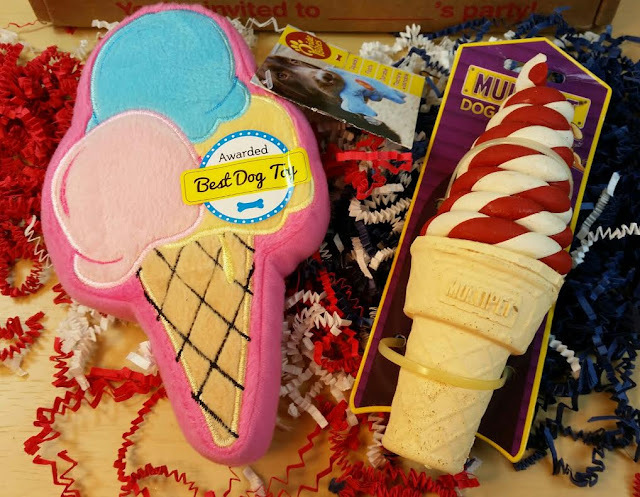 MultiPet Strawberry Ice Cream Cone- This cone is constructed of durable latex and designed to massage the gums while being played with. It also is supposed to smell like strawberries. I couldn't get either dog interested in this one but they tend to prefer plush toys anyway. 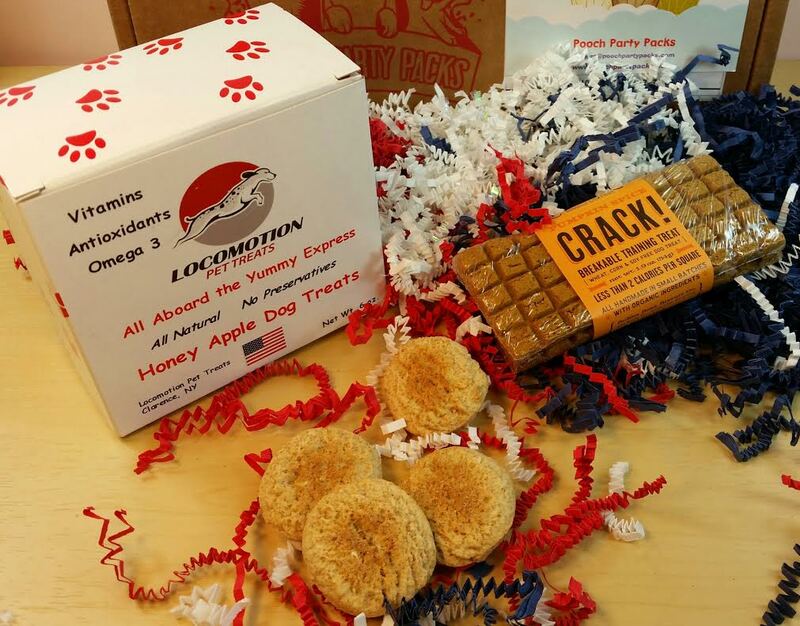 Locomotion Pet Treats Honey Apple Dog Treats- These are human grade, all natural dog treats. Dexter, my treat monster, loves them. They're a good size, not crumbly and are perfect for when we leave the house. We always give the dogs a treat when we leave. They know it, too. So when they hear the keys jingle, they jump into their beds and wait for their treat. I started this when they were puppies to prevent separation anxiety. It worked. Bubba Rose Biscuit Company Pumpkin Spice Crack! Breakable Training Treat- This is two bars of little squares that you can break off. I don't know if I would use these for training just because I have treats that are easier to use and less crumbly but they're definitely fun and the boys will eat them. 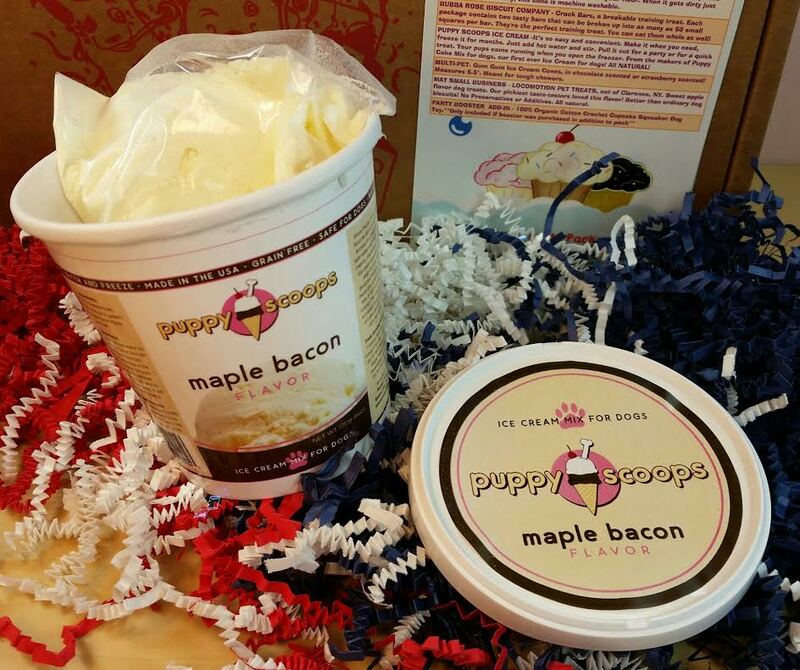 Puppy Scoops Maple Bacon Doggy Ice Cream- This is so awesome! I've never seen anything like this but Dexter loves frozen treats and ice cubes. I added water, stirred and now it's freezing up. It smells terrible in that dog food type of way. Yep, looks good to me. Dexter is going to be SO happy when this is ready to go. 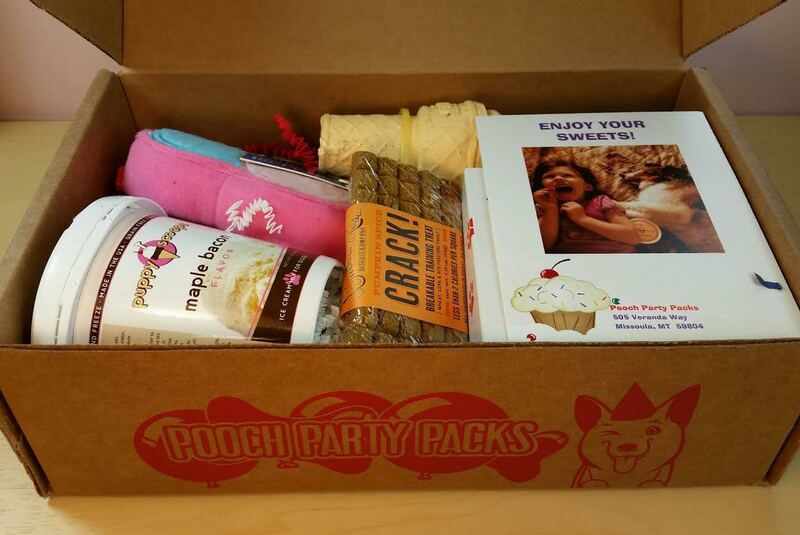 VERDICT: I thought this Pooch Party Pack was wonderfully curated! I loved the theme and how well it was adhered to. I liked that there was both a plush toy and a hard toy to appease any kind of dog preference. I love that the treats come from small US businesses. And I am so happy with the unusual treat of puppy ice cream. The value comes right in at the price paid which is normal for dog boxes. I think that this box is going to be unusual in the treat department with it's focus on independent treat companies. I'm really excited to see what other kinds of things get included in future boxes. And guess what's even better?! A 75% off coupon code for your first box! 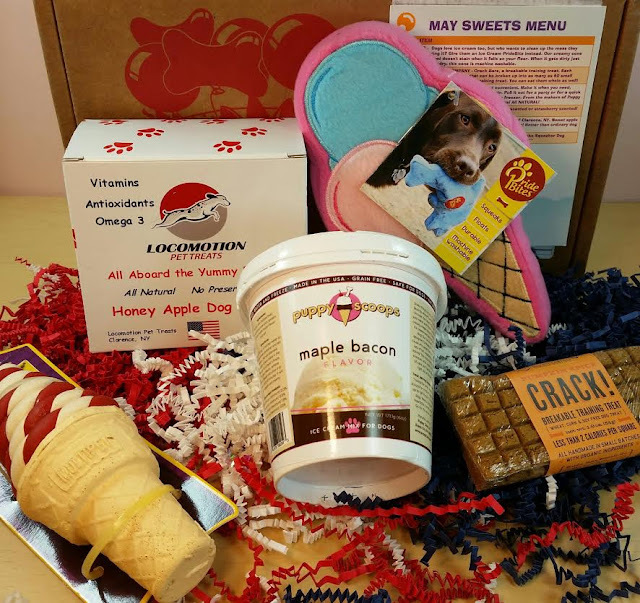 Use code MEMORIAL75 to get 75% off your first box when you sign up at poochpartypacks.com! You have until end of day Monday to take advantage of this so get on it! Bugsy and his ice cream cone. He has a squeaker fetish but he has so far left the squeaker inside of this toy and plays with it. *This box was sent to me for review purposes. All opinions are stubbornly mine. OHMYGOSH AN ICE CREAM BOX. With real doggy ice cream! Definitely winner. I think my second favorite thing would be the rubber strawberry cone. Because strawberries. And it might take Pebbles more than a day to destroy it. I think I like this box better than last month's one! I thought it was a seriously awesome theme. And doggy ice cream!? Win! The strawberry cone is probably the perfect size for Pebbles. How much does she weigh now? It's pretty substantial. She's 16 lbs but acts like she's 60. Watching her run around the yard with an empty gallon jug makes my day! I gave her the BarkBox boxing gloves yesterday and she totally annihilated them in under 5 minutes. I'm talking both gloves pulled off the rope, squeakers out and stuffing everywhere :( She def needs one of these indestructible rubber toys! The larger the better for her big dog complex!